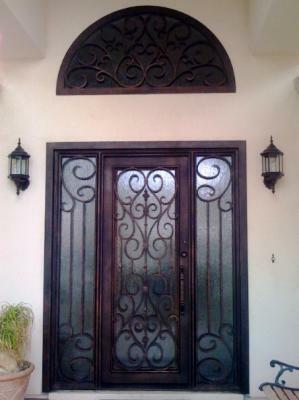 Signature Iron Doors has an array of iron designs for every home. With unprecedented beauty, our doors are the finishing touch for every home. We construct all our products with wrought iron, hand forged by licensed welders. This is a Milan style door for a family near Queen Creek Arizona. The debate on getting that beautiful double door entrance you’ve always imagined with not enough space can be a tough one. Although a single door with sidelights isn’t the same, the effect makes your entrance appear larger. This family came in thinking they wanted a double door and after comparing a double door the same size as this one, they quickly went with the single. At Signature Iron Doors we make it a point to build doors all sizes. Come visit our showroom in Phoenix Arizona to view a gallery of doors in person and find the perfect iron door fit for your home.